Normally, you rely on your IT professionals to keep your network safe. Unfortunately, IT is such a big world these days, your IT professionals may not be aware of what could cost you and your business millions. Today there are many threats to IT security including viruses, spyware, hackers, and misuse of wireless networking. Imagine how much money your organization will lose per hour of downtime if your network goes down. Also estimate the intangibles that will be lost in the event you have to notify your employees and/or clients that you have had a security breach and their private data has been released to identity thieves. Mike has discovered that the vast majority of companies he reviews have at least one major bleeding artery they weren’t even aware of before the review. Often, those are the companies where the IT professionals, at the beginning of the day, stressed that no vulnerabilities would be found. 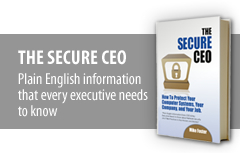 Find out as Mike explains in plain English the shocking truth about how un-secure your business and vital systems likely are—and the critical questions you must ask your IT professionals to ensure that you are safe. Mike will reveal the top 12 key strategies you must review and implement with your IT professionals to make sure your essential information, network and assets are protected. As an added bonus, each person that participates in this session will receive a special “Vital Systems checklist and Security Info Packet” that’s priceless when you prevent a devastating IT loss! While you may think you have this issue covered… is it worth the risk of not knowing for sure? Prevent Loss of Important or Sensitive Data Though Cloud Storage, Ipads, Iphones, etc. Already Hired Mike Foster, CEH, CISA, CISSP? Engage the Foster Institute to help you increase your business productivity and profits.